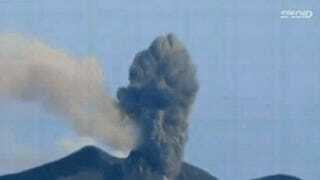 The Mount Sinabung in Sumatra, in western Indonesia, erupted on November 11. It was a mild eruption but it just went into absolutely insane mode yesterday—as these images show. It's four* miles high. The pyroclastic flow of hot volcanic ash discharged from the powerful eruption of Mount Sinabung, in Karo regency, North Sumatra, on Thursday threatened the safety of nearby residents.[...] more than 7,000 residents had been evacuated from the 10 villages. * Updated: Apparently it was four miles high, not 1.9.